Diesel Exhaust vs. Gas Exhaust: What's the Best Choice for Your Rig? How to choose the best diesel or gas exhaust system. Regardless of what type of fuel you put in your rig, your truck produces a number of harmful gases that must be evacuated through its engine. 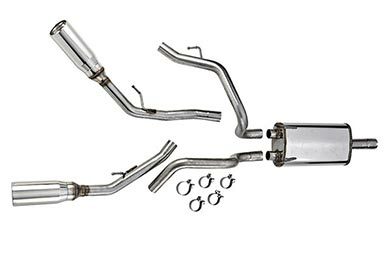 In order for you to get the best performance out of your truck, you need an exhaust system that’s optimized to perform this task as efficiently as possible without taking a toll on fuel economy or horsepower. This can be achieved with a gas or diesel exhaust system. 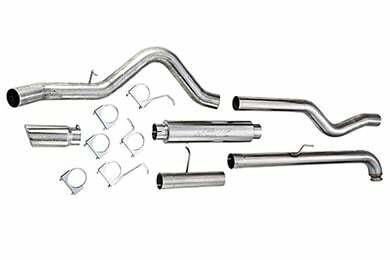 But, in order to get the best results possible, you’ll want to choose the best exhaust system possible. When it comes to comparing diesel vs. gas exhaust systems, there are some design and functionality factors worth mentioning. For instance, every modern engine uses a catalytic converter to trap exhaust. As the exhaust flows through, it’s superheated and passed through a series of precious metals which results in less harmful emmissions. A diesel converter often uses an oxygen storage system that helps more fully oxidize harmful emissions when your pedal hits the metal. Gasoline and diesel exhaust systems are engineered in much the same way, however, the diesel exhaust design is much more critical to engine longevity and horsepower. A diesel exhaust that’s too restrictive will trap heat in the turbocharger which can destroy the turbo. Diesel rigs and other turbo-charged engines need a very free-flowing exhaust to reduce backpressure inside the turbo itself. Rather than focusing too much on the dilemma of whether to run a diesel exhaust or a gasoline exhaust, you should focus more on choosing a high-quality exhaust system for your rig. You should stick with the brand names you can trust, like MBRP exhaust and Heartthrob exhaust. And, choose from a variety of cat back exhaust systems that are custom crafted for your exact year, make and model in order to ensure the best results. Check out the numerous performance exhaust reviews on our website in order to help you make an informed buying decision. You can easily compare exhaust tips for cars, or read up on the different Flowmaster mufflers. Even compare the dual exhaust with the single exhaust to see which would be a better fit for your truck. We make it easy for you to get the information you need. I was very impressed on how easy it was to install on my 94 Chevy k1500. It also sounded great! I wasn't expecting it to be as loud or deep but it impressed me. Very good product! Hey, I’m looking for some info. the vehicle is a 97 Ford Windstar gl 3.8l and I want to know about the catalytic converter. Thank you for your inquiry about a catalytic converter for your Windstar. This is the correct part for 3.8 V6-equipped Windstars with federal emissions for use on vehicles not registered in the state of California. This is a direct fit part that makes installation easier since it will bolt right on instead of having to have it welded in. It cannot be shipped to California. They ship out within just a few days of ordering. Thank you. What does CARB stand for? What exactly does CARB stand for, and why are they so strict? It stands for California Air Resources Board. Many years ago, California was dealing with so much vehicle-generated pollution, that they decided to set guidelines for emissions. It has worked so well at abating smog, that many other states are now adopting the standard. Check here for details and a list of states that follow the CARB standard. Reference # 752-906-212 © 2000-2019 AutoAnything, Inc.